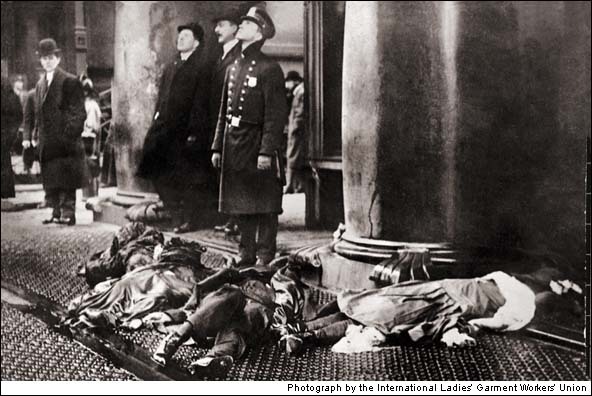 March 25, 2011 is the 100th anniversary of the fire at the Triangle Shirtwaist Factory that cost 129 girls and 17 men their lives and led to widespread labor reforms. Most of these girls were age 16 to 23 and very recent immigrants to America. I think of my mother, who worked in a sewing factory when I was a child. I think of a hundred ambitious, lively, young girls still wide-eyed with being in a new country full of promise, standing hand-in-hand on the roof, faced with jumping ten stories to their deaths or being burned alive. For those who are unaware of the infamous story, twenty minutes before the end of the workday on Saturday, March 25, 1911, fire broke out on the 8th floor of the Triangle Shirtwaist Factory where 500 women and 100 men were busy sewing button-up shirts. With combustible cloth hanging everywhere, the fire quickly spread. While many on the 8th floor escaped on one overloaded elevator before the heat made it impossible, the girls on the 9th floor found that the door to the stairwell was locked and there was only one fire escape that quickly buckled beneath them. On the 10th floor, after the workers had climbed to the roof on the one available ladder, they realized they could not get down to safety. The firemen’s ladders were designed for six story buildings and could not reach the upper floors of the new cast-iron building. Thousands of people gathered and helplessly watched in horror as girls began to jump. Five girls who stood together at a window close to the Greene Street corner, held their places while a fire ladder was worked toward them, but which stopped at its full length two stories lower down. They leaped together, clinging to each other, with fire streaming back from their hair and dresses. Owners Max Blanck and Isaac Harris were rabidly anti-union and known as the "shirtwaist kings" of New York. They had locked the door to the stairwell on the 9th floor to prevent girls from stealing and were subsequently charged with manslaughter, but acquitted with the help of a lawyer who insinuated that the survivors who provided testimony were coached by the union. Blanck was fined $20 for locking the doors to yet another factory two years later. But the fire did inspire labor reforms that made the workplace a little less deadly: in 1912, fire drills and automatic sprinklers became law. Many of the girls who worked in the Triangle Shirtwaist Factory lived in the Lower East Side, still reeling from the General Slocum disaster, which had claimed over 1,000 lives in 1904. To get an idea of the fire's impact on the Lower East Side, take a look at this stunning map created by Remember the Triangle Fire Coalition, who are also behind the Chalk project, in which volunteer artists chalk the names of Triangle Shirtwaist Factory victims on the sidewalk in front of their old residences on March 25. On 11th Street where I lived, I used to go home on the anniversary of the fire, thinking of 14-year old Kate Leone and 18-year old Jennie Pildescu who never came home that fatal Saturday. Here's an eyewitness account from the tragic day and some sad photographs - even the city coroner wept. A hundred years later, with the battle over collective bargaining being decided in Wisconsin, it’s more than timely to pause on March 25 to remember that the labor laws we take for granted – the eight-hour day, the 40-hour week, minimum wage, sanitary and safe conditions, unemployment insurance –were rights that were fought for and won at the cost of many lives. The Remember the Triangle Fire Coalition is holding a procession at 11AM at the site of the former Triangle Shirtwaist Factory near Washington Square Park. Barbara Kahn, who writes interesting plays on lesbians in history, has written BIRD ON FIRE, a musical that depicts the fictional lives of two women who worked at the Triangle Shirtwaist Factory. It's at Theater for the New City until April 10th.